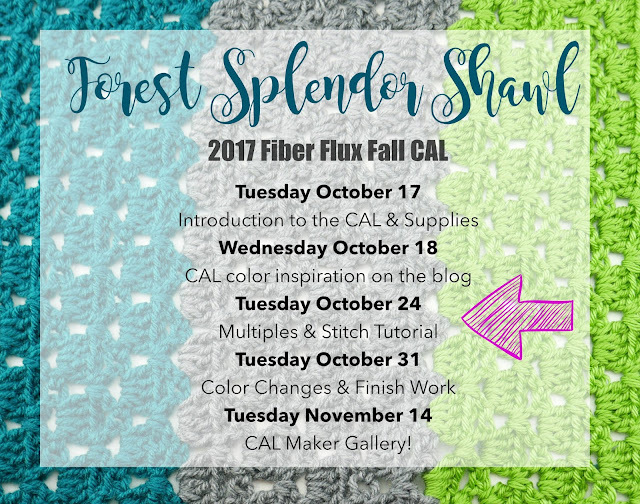 Welcome back for week 2 of the 2017 Fiber Flux Fall Crochet Along! Today we'll be learning how to customize the size of your shawl with multiples and how to work the gorgeously easy stitch pattern! Row 1: In the 6th ch from the hook, work (dc, ch 2 , dc) *skip 3 ch, then in the next ch work (dc, ch 2, dc), rpt from * to last 3 ch, skip the next 2 ch, then work a dc in the last ch. Row 2: Ch3 and turn, *work 4 dc in the ch 2 space (from previous row). Repeat to the end of the row, then work a dc in the turning chain space. Row 3: Ch 4 and turn (note this turning ch has one extra ch, because this forms part of the first "v" of the row). Work a dc in the space between the first 2 dc. *skip 4 dc, then work (dc, ch 2, dc) in the space before the next group of 4 dc, repeat from * across. Work dc, ch 1, dc in the turning chain space. Row 4: Ch 3 and turn. Work 2 dc in the ch 1 space (from previous row) * skip 2 dc, the work 4 dc in the ch 2 space, repeat from * across. Work 3 dc in the turning chain space. Row 5: Ch 3 and turn. Skip the first 3 dc from the previous row. *Work (dc, ch 2, dc) in the space before the next group, skip 4 dc, repeat from * across, then work a dc in the turning ch space. 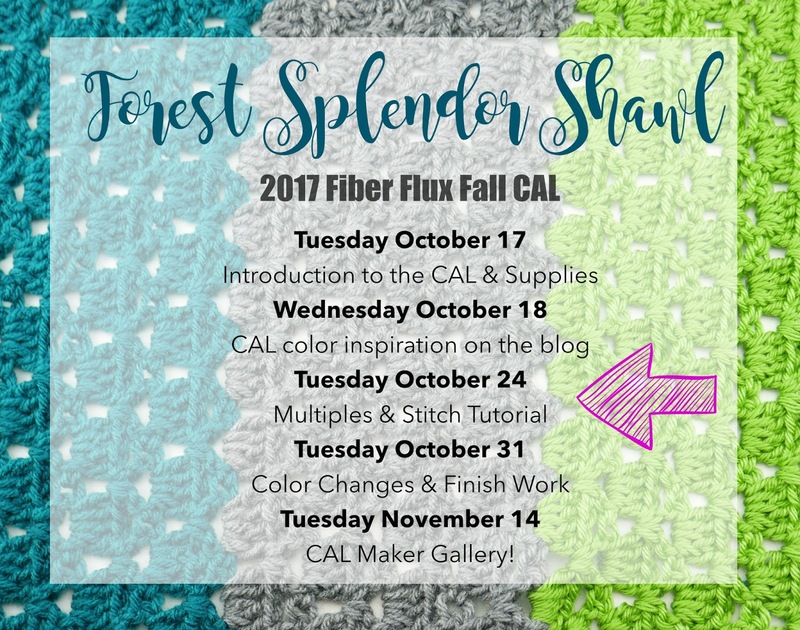 Tuesday October 17: Introduction to the CAL, the project, size of finished shawl, yarn, and supplies needed. Tuesday October 24 (that's today! 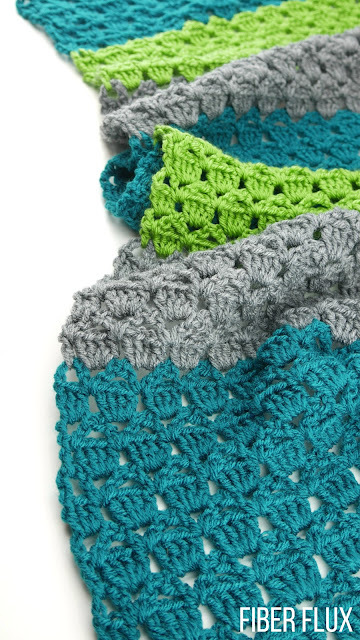 ): Pattern multiples and the stitch tutorial. Wednesday, November 1st: The BIG reveal! See the finished piece on the blog and channel! Tuesday November 14: Today is Maker Gallery Day! 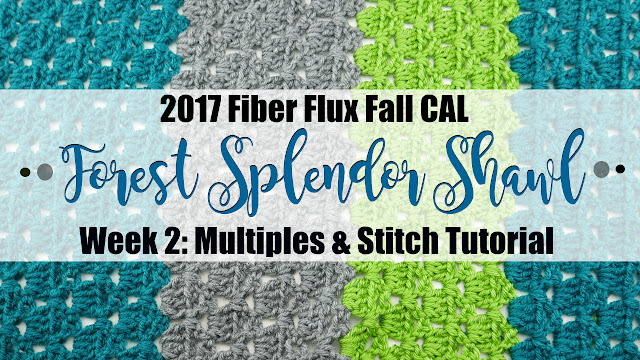 Check it out to see all of the gorgeous shawls from the Fiber Flux community! 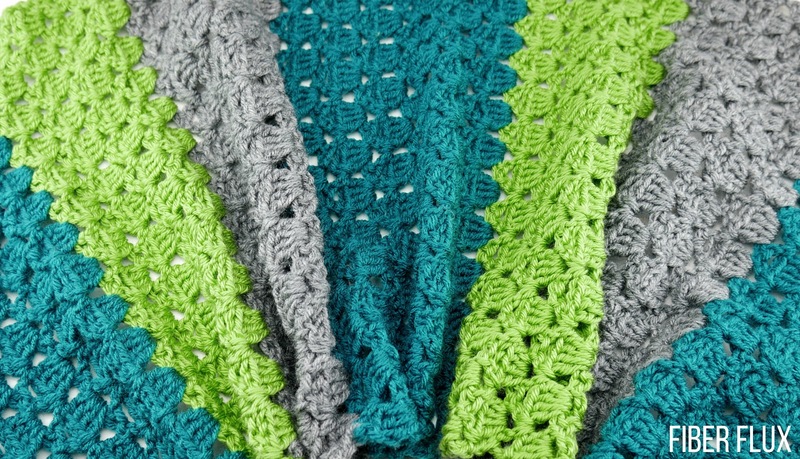 Also I have set up a special group for us on Ravelry, the "Fiber Flux CAL Group" There is a special welcome area, so please hop on and introduce yourself. You can get info, ask questions, help each other, see what everyone is doing, and show off your work too!